Runners 🏃 🏃‍♀️ At the start line. 26 miles and 385 yards ahead of them. No rain, No sleet, No snow, Can keep them from the end. Up heart-break hill, Straight ahead. Crowds roaring. Runners pushing. Runners exhilarated. Finish line is within sight. Painful last moments melting away. There’s no turning back now. The runners hard work paid off in full with a successful finish. The glory is all theirs. 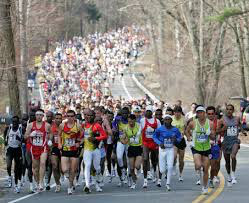 365 days from now, all will gather again to cheer on the runners of the next Boston Marathon. Through thick and thin, each runner is unstoppable until they cross the finish line.